The Duchess of Cambridge usually downplays the princess factor when it comes to her wardrobe, as you're more likely to see her in a Breton stripe than anything frothy. But every now and then she delivers a dreamy Disney-esque style moment, and last night she wore perhaps her most "princessy" look to date. An evening reception at Buckingham Palace is the perfect opportunity to wear diamonds, and Kate wore a magnificent tiara from the royal family safe for the fifth time. The Cambridge Lover's Knot Tiara is a sentimental family piece, as it was given to Princess Diana as a wedding present by the Queen in 1981. 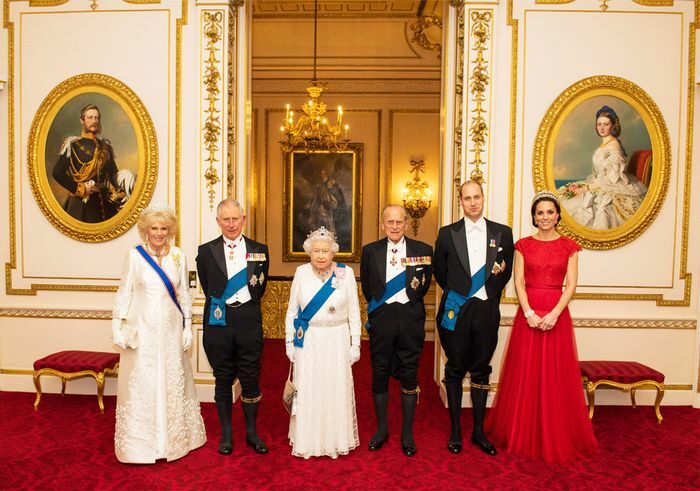 Kate attended a diplomatic reception at Buckingham Palace with the senior royals and wore a red sweeping ball gown by one of her favourite designers, Jenny Packham. She first wore this evening gown back in 2015 to a state banquet for the Chinese president's visit to the UK. On the Duchess of Cambridge: Custom Jenny Packham gown and the Cambridge Lover's Knot Tiara. The brocade-effect gives this dress a real princess feel.